For more information on other special events in Oregon! Oregon is a land of unmatched Majesty and Grandeur, the land that Lewis and Clark set out to explore and the reward at the end of the pioneer's trail. From its mountains of thick fern covered forests, high Cascade Mountains and pristine lakes, to it's roaring rivers and Crater Lake, the deepest lake in North America, Oregon gets you! It's rugged rivers, and lush fertile valleys and The Columbia River Gorge with miles of plummeting water falls and scenic Historic Hwy make Oregon a paradise cherished by those who call it home and enjoyed by all who visit. The Oregon Landscape, the hearty fortitude of it's pioneers and the creativity of it's founders has inspired a way of life in Oregon that is in harmony with nature, harvesting and creating from it's bounty fine wines and culinary art and a creativity that drives a culture of art, music and the appreciation of the most precious things in life. The Oregon Coast stretches four hundred miles, it's breathtaking beauty enchanting all that visit or live here. Huge stone islands rise out of the shoreline waters as lush pine forests meet the powerful blue Pacific Ocean. Charming resort towns and fishing villages with their little bays and river outlets, span a coast known for it's rugged beauty, lighthouses and great historic significance. Whale watching, canoeing, beachcombing, hiking and fishing extend from north to south on the Coast, as each community is a gem on the sands of a mighty sea. At the mouth of the Columbia River, Salmon began their journey back upriver from the sea, and the city of Astoria and Warrenton, mark the end of the Lewis and Clark Trail. . Astoria has been the scenic backdrop for many movies such as Kindergarten Cop, Free Willy, The Goonies and Short Circuit and movie tours are a popular attraction. To the South, Newport is a marine science center of discovery, with the Hatfield Marine Science Center, Marine Discovery Tours and the Oregon Coast Aquarium giving visitors a glimpse into the sea. Located in the center of the 47-mile stretch of sand dunes that comprises the Oregon Dunes National Recreational Area, Reedsport is considered the "heart of the Oregon Dunes". The Oregon International Port of Coos Bay is a large commercial port and Coos Bay is also a center for shopping, dining and entertainment. The Pony Village Shopping Mall is the largest indoor shopping mall on the coast. The Rogue River's wild and scenic journey ends here at Gold Beach where gold was found in the 1800's. Jet Boat Rides are a great attraction as they zoom up river and river front resorts offer accommodations. Known as "The City of Roses, Portland is a major port city with it's grand bridges crossing the great Columbia River and The Willamette as they join beneath modern skyscrapers and pine covered mountains. The snowcapped peaks of the surrounding cascades can be seen from the City that is an historic and cultural center with art and education it's heart. Washington Park is set high overlooking the city on it's west side and features many of the city's greatest attractions including the Oregon Zoo, The Japanese Gardens, and the International Rose Tent Gardens drawing visitors worldwide. Portland is one of America's biggest and most beautiful cities. The Portland Rose Festival, kicking off in June, features an art festival, Festival of the Bands, Boat Races, Fireworks, Grand Prix and Starlight Parade. Portland loves a party and its residents also love their sports teams. The Portland Trail Blazers basketball team, Portland Winter Hawks Hockey Team, Portland Beavers Baseball Team and Portland Timbers Soccer Team enjoy an enthusiastic fan base from their proud city. The Historic Journey of Lewis and Clark took them through the breathtaking Columbia River Gorge. The sites they saw still dazzle residents and visitors alike as they drive east out of Portland along the Gorge. The Columbia River Gorge offers some of the world's most stunning vistas along miles of river. The Historic Columbia River Gorge Highway winds along the cliffs, it's gentle curves, elegant stonework and graceful bridges are unforgettable as is the scenery it winds through. A series of waterfalls drop 300 feet into pools below to one side and the majestic Columbia River on the other. The Highway itself is an attraction, designed by Samuel C. Lancaster in the early 1900's; its decorative stone structure is highway artistry from a bygone era. The highway leads through forests and up the cliff sides and crests at Crown Point, an historic landmark lookout point that provides Panoramic views over the Columbia River, and The Cascade Mountains of Washington and Oregon. The Gorge is a climatic wonder as rainfall on it's West end near Portland is close to 40 inches per year and drops to half the amount as you travel east to Hood River and reach very modest rainfall on it's eastern end near The Dalles Oregon. This rich lush central valley produces luscious fruits, excellent wines and great minds. It's historic cities such as Corvallis and Eugene are also popular college towns. Eugene, the third largest city in Oregon is home of University of Oregon, Northwest Christian College, Eugene Bible College and Lane Community College. Corvallis is home of Oregon State University and hosts one of Oregon's most popular cultural events. Da Vinci Days, held annually, celebrating art, science, and technology with artistic exhibits, a children's parade and film and video festival. 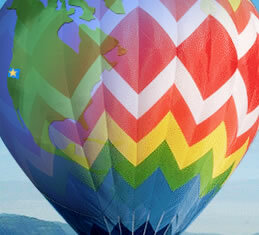 Ballooning is popular here in the Willamette Valley as are tours through the wine country. There are many attractions including The Hatfield Marine Science Center giving children a behind the scenes look at the Marine Research Facility operated by OSU. The annual SeaFest gives visitors the opportunity to view labs and talk to scientists. The Springfield Bach Festival draws music lovers to celebrate classical music at it's best! The Lake County Farmers Market showcases the produce and culinary delights of this rich green and fertile region of Oregon known for its covered bridges and flowing rivers. Winding over Oregon's fur covered Siskiyou pass into the lush Rogue Valley in Southern Oregon, you began to mine deep into the History of the West from the Gold Rush era to the roaring 20's. In Ashland, Oregon the roaring 20's come to life in the image of a grand great hotel and the history of Lithia Springs, where bathers once came from miles around to bask in the healing waters rich with Lithium. Here rejuvenation still comes to the traveler who visits the Ashland Springs Hotel and the Blue Giraffe Spa. This grand hotel has been restored to it's previous grandeur and houses rare collections of botanicals, etchings and artifacts that complement the theme that has drawn people to Ashland for several centuries to experience the healing properties of nature and the natural balance of life. Ashland Springs Hotel is walking distance to the world famous Oregon Shakespeare Festival where we celebrate the timeless enchantment of moonlit evenings of Shakespeare under the stars. Just minutes from downtown Ashland is the Mount Ashland Ski Resort and a short drive up Dead Indian Memorial Hwy is Howard Prairie Lake with it's Pine covered Islands in the forefront of snow covered Mount Mackenzie. While in nearby Jacksonville, the Gold Rush Era is relived at Jacksonville Inn and Gold Dust can still be seen in the walls of the Historic Inn. The Jacksonville Inn is #9 on the National Historic register and is also a five star restaurant. The Britt Festival is located in this landmark town, where all summer long world-class performances are held in Britt gardens, an outdoor theatre overlooking the Rogue Valley. Just North out of Grants Pass you can take in the beauty and wildlife seen on a backcountry jet boat excursion down the Rogue River, and access Hwy 199 leading to the Coast through the Redwoods. Just North East of the Rogue Valley in Southern Oregon are the deep waters of Crater Lake, the deepest Lake in the United States of America. On the East side of the snow-covered Oregon Cascade Mountains lays Central Oregon. It's ideal climate boasts 300 clear days per year. The popular City of Bend is here with it's excellent golf courses, views of the cascades, and skiing on nearby Mt. Bachelor. Rock climbing, fly-fishing, mountain biking, hiking and ballooning are just a few of the outdoor activities that abound in Central Oregon. The Newberry National Volcanic Monument and Smith Rock State Park are popular destinations and Three Sisters Mountains grace the Western landscape. Shops, galleries, fine dining; concerts, events and cultural celebrations abound in the growing and thriving Central Oregon communities. Eastern Oregon makes up a large part of the state. It is less populated then the other regions and is study in contrasts. Eastern Oregon is mysteriously beautiful and enchanting from its northern mountainous region and the snow covered peaks of Wallowas to the rolling wheat fields of the Columbia River Plateau. Life in the small quaint towns of Eastern Oregon seems to stand still. The rolling painted hills of Eastern Oregon with hues of red, yellows and browns brush stroked by natures fury in swirling patterns across the landscape are breathtaking. Long sloping cliffs, layered in shelves, formed by volcanic activity, and wide-open plains filled with desert flowers characterize much of Eastern Oregon. 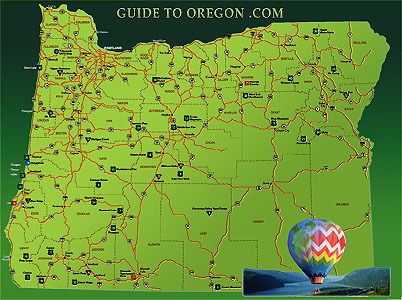 Presented in easy to find format for all Regions and Cities in Oregon. © Copyright GuideToOregon.com & Purpose Media.